NEW YORK—”It’s no accident that I’m involved here,” says Robert W. Pillsbury with a sense of purpose and reverence. The president of the Salmagundi Club often gazes at a dreamy painting displayed in the elegant parlor of the club. At quick glance, “Nightfall” by Franklin De Haven could be mistaken for a painting made by Pillsbury himself. “It’s by one of my forefathers,” he clarifies, still gazing at the moonlit landscape painted in 1900. Salmagundi is the second-oldest art organization in the country, and it is arguably also the most active, most lively, and inviting. Pillsbury has always gravitated toward art. He carries the conversation, focusing on one painting in the parlor and then on the next one. They are what the club refers to as “purchase prizes.” They constitute a rotating permanent collection of about 200 highly selective juried works made by Salmagundians, who received cash prizes in exchange for their works of art. Currently, only two paintings in the parlor are not part of that collection. One was donated by the wife of the late Frank Mason. The painting of a Vermont farm scene is going for silent auction as part of a fundraiser for the club on Sept. 23. The second hangs above the fireplace, a maritime painting on loan from the 87-year-old artist John Stobart, who’s currently working on a painting especially for the club. “Salmagundi is all about the love of making art, displaying art, discussing and appreciating art,” Pillsbury says, looking around the parlor of the historic brownstone, built in 1852 and acquired as the club’s permanent home in 1871. Originally called the Salmagundi Sketch Club, a group of students and instructors of the National Academy who wanted to paint from life established the club in 1871. At that time, there was a huge influx of fine artists who earned their livings doing illustrations and reproduction work for newspapers and magazines, and lithography and printmaking were very prevalent. “Those guys wanted a place to hang out and draw together. That’s how it started,” Pillsbury explains. Pillsbury reaches back into the past, reflects on the art around him, on the significance of Salmagundi, and yet is also thinking about at least the next four practical steps that have to take place down the road, as well as all of the people he wants to connect with to get them involved. Along with Tim Newton, the chairman of the board and an art collector, he has been honing the master plan for renovations and for centennial events coming up in 2017, meeting with the board and going from one committee meeting to another. The biggest challenge is raising the funds for projects to make improvements while continuing the costly maintenance and repairs for a building of this age. He deals with a medley of issues. It could be illustrated like a salad or stew of thoughts, with just the right ingredients—similar to how the club derived its name, either after Washington Irving’s potpourri of wit called “The Salmagundi Papers,” or a Salmagundi salad served to King James II, or Salmagundi Stew, which the club continues to serve in its restaurant. It’s kind of hard to explain, but there’s this creative energy en masse here. His eyes sparkle, revealing how fascinated he is about that interaction, revealing his insatiable curiosity and need to communicate visually. Pillsbury has been creating art since he was a child, went on to complete his fine art degree at the Maryland Institute College of Art (MICA), and worked in the printing business in production for 35 years in New York. “I was in the studio painting this morning,” he says and shows photos of a series of paintings, drawings, prints, and encaustics he’s been posting on his Facebook and Instagram accounts every day. Pillsbury is exemplary of most Salmagundians, who are working artists (about 70 percent) or are actively involved in the arts in some way. The club manager, Chris Nunnally, who intersects with Pillsbury in sorting out the schedule, among other things, walks into the parlor and says, “I never thought I would need to use all of the skills I’ve learned all in one place!” He smiles. The creative energy and sense of camaraderie in the historic brownstone is palpable. There’s always something going on, like the all-night drawathons, monthly monotype parties, art classes, auctions, exhibitions, openings, celebrations, and other activities like tango dancing and film shoots—and Pillsbury’s favorite, the annual president’s dinner when he has the privilege of giving the prestigious Salmagundi medal of honor to a distinguished citizen. “It’s kind of hard to explain, but there’s this creative energy en masse here. You don’t really feel like you are tired or sleepy,” he says about the all-night drawathons as an example, where at least six models take turns posing in different rooms of the club. That biannual activity was instigated by the junior members (21- to 35-year-olds). There’s a lot of history here; basically the who’s who in American art is our membership. When Pillsbury became Salmagundi’s 50th president three years ago, he entered into a completely new, challenging phase in his life. “What I’m trying to do is to relate our past and the magic of that history, and find ways to bring those things into the present and perpetuate them into the future,” he says. The monthly monotype party was a piece of the club’s history that was forgotten for eight decades. Pillsbury wants to discover and restart other Salmagundi traditions like that, and start new ones too. During the mid-July monotype party, Ed Brennan, former chairman and president emeritus of the club, cheerfully lauded Pillsbury. “This guy is one of the best presidents we’ve ever had. He’s not in it for himself. He thinks of this place all the time. He’s of service to the membership, and we are happy with him. Fabulous!” Brennan said. During his first year as president, he kept the club running while the main gallery was being renovated. The skylight—which had collapsed during a snowstorm and had been covered over in the 1970s—was rebuilt with the original design in mind, yet installed with state-of-the-art lighting and heating/cooling system, new walls, and floorboards. “During that time period, I said, ‘We need to run the club in half the space, and that’s what we did. For a year, we had all our activities downstairs and we made it happen. My concern was that if we had stopped, it would have taken a long time to get the momentum going again, so by scaling it down we didn’t lose momentum. It was really hard, but we just kept moving forward,” he says. The renovations will continue, according to the master plan, including putting an elevator in the core of the building and moving the entire library one floor up. “Next week all the Persian rugs are going out for cleaning and repairs,” he says as he walks out of the parlor and into the hallway, where his portrait by the artist and junior Salmagundian Edmond Rochat is hanging. “I wanted one of the junior members to paint my portrait because I was chairman of the Junior/Scholarship group here for several years before becoming president, and felt a need to include that group in the historical tradition of the painting of presidential portraits,” he says. Declarations honoring Salmagundians who served in both World Wars are displayed in the main hallway. Palettes of J. Francis Murphy and George Inness Jr. in glass cases show the American artists’ choices of pigments, and remnants of their mixing techniques. A bust of Sir Winston Churchill stands by the stairwell. “He didn’t spend much time here, but he was an honorary member and was a pretty good painter,” Pillsbury says. Andrew Wyeth’s father, N.C. Wyeth, and Buckminster Fuller, among others, were also honorary members. As Pillsbury walks up the stairs to the second floor, he points out more artists’ palettes across the top of the walls of the hallway and in the library. It’s the largest single collection of artist palettes in the country. “There’s a lot of history here; basically the who’s who in American art is our membership,” he says, carrying a big brass ring holding the keys to the library. He enjoys spending time in the library. He points to a bit of dust on a shelf, remnants of the aging pages of his favorite book by Sir Walter Armstrong, a treasure of lithographs of Joseph Mallord William Turner’s work. “It needs some restoration work,” he says almost in a whisper. He opens the book. “These are original plates, original lithographs in the book. See the plate marks on the ends, that’s from the stone,” he says. It does not have a publication date on it, so he figures it must have been printed before 1850, before printers started dating books on the front leaf. The numerous aging books in the library—some stored in a locked cabinet and dating back to the 16th century—all seemed to be crying out for a whole team of conservators for restoration. Once the library is rebuilt on the third floor, they will be safely stored in temperature-controlled airtight cabinets. It will take more fundraising and more than several steps to get there. At that time he didn’t know why, what, or how. He became a member, but for the first four or five years didn’t get involved much. One thing led to another, and here he is now steering the boat. “I truly believe that we are destined to do certain things. There’s a reason why I paint; there’s a reason why I’m here. It could not have happened any other way. This is not a casual adventure for me. I feel very strongly that I have to lead this organization in a manner to make improvements where I can, and pass the baton in a meaningful way,” he says. The following day, Pillsbury will wake up between 4 and 5 in the morning to face his easel and finish his piece of the day, fulfilling his commitment to himself, and he then will probably go to the Salmagundi Club, connecting with people and carrying out the next four or five steps to help foster a beautiful legacy. 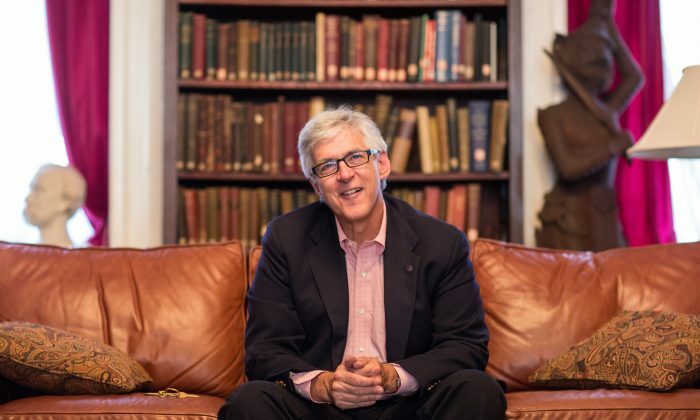 “It’s not only being a kind of connector within the membership, but it’s the spreading of the joy of making art and art appreciation both inside and outside of the organization, and that is what my job is,” he says, smiling big.